The eleven hundred dollar price tag derailed my temptation of the Philip Bloom Signature Edition Pocket Dolly by Kessler. Believe me, you get what you pay for in this day of age. His cinematic tool looks like a fabulous piece of machinery but a little steep in the wallet for most. A quick Google search came up with an unusual result. A German industrial manufacturer specializing in mechanical systems with polymer bearing technology called IGUS. Confused? I did not believe this at first but a quick search of IGUS on Amazon.com came up with a surprising affordable camera slider solution. For one hundred and fifty dollars, you get a precision Drylin bearing slider on a four inch by three feet piece of metal rail. The IGUS W1080-B with pre drilled holes to be exact. A Manfrotto 701 HDV fluid head and Benro Carbon Fiber legs from my friends at North Tampa Photography plus a quick trip to the local hardware store, you can be setup very quickly for your next cinematic masterpiece. 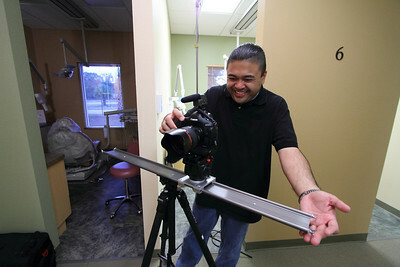 Well, I would not call my quick holiday weekend production shoot at Hermano Family Dentistry anything but epic. Dental eye candy fits the description better. I used a Canon EOS 1D Mark IV with EF 85mm f/1.2L, EF 35mm f/1.4L and the EF 17-40mm f/4L lenses. I paired the camera with the Sennheiser MKE 400 microphone for audio and used a Manfrotto 501 HDV fluid head for my other shots. 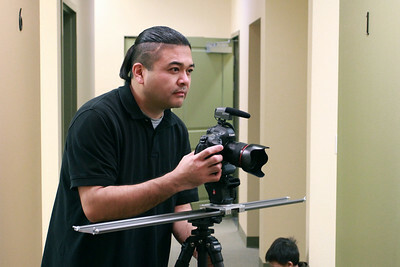 The wonderful behind the scene photographs are provided by the "Time Lapse Guru", Getawaymoments. The IGUS Drylin Camera Slider W1080-B is the perfect size to handle the heft of the Canon EOS 1D Mark IV with a large lens with no problem. Anything heavier on either ends of the rail can be solved by a two tripod system. For even a lighter rig, you can support one end with full size legs and the other end with a monopod. The IGUS Drylin Camera Slider Video Test was an astounding success. This great value for the money cinematic tool provided an invaluable element to this production. This unbeatable combination from IGUS paired with an HD Dslr is a "must have" especially compared to the more expensive Philip Bloom Signature Pocket Dolly. You will be seeing more of the IGUS Drylin Camera Slider in my future productions. Love that last tilt with graphic, well done. Come on, tell everyone you doctored this photo at the Dentists office! may i use your blog as references? i'm igus representative sales agent. Yes, feel free to use my PhotoBlog as an IGUS reference. Greetings from stateside! By seeing and reading this blog I would like to learn the course of professional photography and would like to do career in film making.